Openly gay Bertrand Delanoë has been the mayor of Paris for over ten years (since March 18, 2001), when control of the city was won by a leftist alliance for the first time since the Paris Commune of 1871. Some things are worth waiting for. 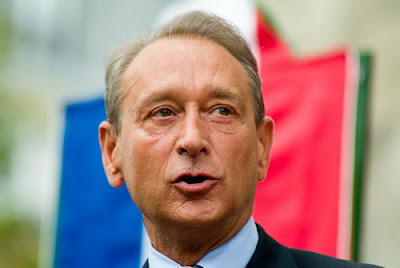 Delanoë was virtually unknown before his election in 2001, but he soon gained fame for organizing new and unusual populist events in Paris, such as “Paris Plages,” an artificial beach constructed on the banks of the Seine each July and August. Paris empties out in late summer, as most locals head south to Mediterranean resorts. But for hotel, restaurant and other employees who must remain in the city, “Paris Plage” affords a way to relax, soak up the sun, swim (floating barge swimming pools anchored along the river), dance and hear live music right in the center of Paris. The popular program, initiated in 2002, was completely off my radar when I arrived to spend August in Paris in 2008. 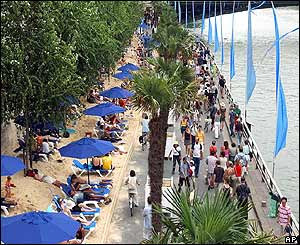 Imagine my surprise when I first crossed the Seine to see palm trees, beach chairs, sand and beach umbrellas covering a right bank river-side roadway. This feature has been copied by other international cities. He also originated “Nuit Blanche” (Sleepless Night), a dusk to dawn festival of parties around Paris, with museums, galleries and public spaces open all night. During the first Nuit Blanche event in 2002, Delanoë threw open the formerly inaccessible doors of city hall (Hôtel de Ville). While mingling with the public, he was stabbed by a Muslim immigrant who told police, "I hate politicians, the Socialist Party, and homosexuals." Delanoë's wound was thought to be minor, but he remained in the hospital for two weeks. Delanoë has since converted the city hall's opulent mayor’s private apartments into a day nursery for the children of municipal workers. The mayor currently resides in his own personal residence in the Marais district, ground zero of gay Paris. Palm trees, sand and beach umbrellas along the Seine. As Mayor, Delanoë has worked to improve the quality of life for Parisians, with goals of reducing pollution, reining in the number of motorized vehicles in the city center and closing some streets to vehicular traffic. He introduced a popular program of inexpensive bicycle rentals stationed along the streets throughout the city in an effort to supplant polluting automobiles and ease the difficult parking situation. Beginning in December, 2011, small cars will also be available for rent from sidewalk locations (akin to our ZipCar). Delanoë was reelected in 2008 to a term that ends in 2014. He remains the only openly gay politician in France, and his popularity is the greatest of any elected official in the entire nation. Delanoë's name is often mentioned as a possible candidate for president of France in the next national election. Political progress: Berlin and Hamburg both have gay mayors. When Hamburg's former vice mayor Ronald Schill outed the city's Mayor Ole von Beust at a press conference in 2003, Germany's citizens mocked Schill, and Von Beust went on to win the 2004 elections in a landslide. In the USA, the citizens of Houston, our fourth largest city, elected Annise Parker, an openly gay woman, as mayor in 2009; only 18% of voters had issues with her sexual orientation.